Toys are the best friends of a baby and a great solution to keep him engaged. Playing with the toys reflect what your baby is learning. With the help of the eye-catching and innovative toys, you create a customized world for your little one and contribute to his journey of learning various things. Fisher Price embellishes the childhood wonderful toys that encourage fun and learning. A colorful bucket with many sections to fill the colorful blocks of different sizes is surely worth your baby’s playtime. By placing the right block into the right spots, your baby can develop a sense of shapes and sizes. The toy boosts the hand-eye coordination of your kid. Not only this; the bright colors of the blocks develop a sense of recognizing the colors as well. Your baby can easily move the bucket also holding the handle available above the lid. Imagine if every leg movement of your little one would have produced some music. The multicoloured kick and play piano toy can make it possible. Another brilliant innovation from Fisher Price can be experienced through this stylish and colorful piano. You can play a short or long piece of music or control the volume of the playing music through the given buttons. The hanging accessories on the top of the piano keep your baby engaged. Your baby can play this toy piano in four different ways. No more boring playtime! The compelling playwall with multiple colors, interesting sounds and wonderful designs offers dual fun through both the sides. There are four colorful roller blocks for trying different games on both the sides of the playwall. The innovative design of the product helps a baby try different games while growing. The playwall can be used while sitting as well as standing. The colors and shapes stimulate your baby’s senses. Let him twist or turn the colorful bead balls for finger movements and hand-eye coordination. The product is a complete fun and entertainment package. The vibrant colors and interesting shapes are good for your baby’s mental and physical development. The product is light and easily portable. 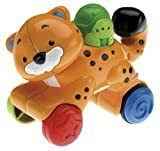 The adorable pair of cheetah and turtle in the press and go toy will definitely leave your baby amazed. It’s indeed surprising to watch the cheetah run when the baby presses the cute turtle. Babies are fond of animals and this product can be an apt thing to place on your baby’s playtime toy shelf. The toy is easy to operate and light. 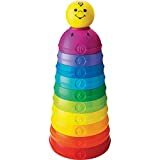 The Fisher Price Basics stack and roll cups are completely fun, educational and safe for the babies. A baby can try different shapes by nesting, rolling down and stacking the cups. The cups are curved and colorful which boosts the sense of colors and shapes in the baby. The product is simple, compelling and strong. Tring-Tring Hello-Hello! Your baby may be watching you calling your friends, family or acquaintances and wondering what exactly is that wonder device. You can bring a toy telephone from Fisher Price to your little one can keep him engaged on his virtual calls. The telephone has four wheels and a chord that can be held to pull the telephone. With the colorful big building blocks, your baby can turn his creative imaginations into reality. The smooth and strong blocks can be combined to give desired shapes of different sizes. With the help of these 80 colorful blocks, your baby can turn into an architect and give wings to his creativity for hours. The animal-shaped toys and accessories give a completely different view of jungle to the babies and boost their imaginative skills. This tempting Fisher Price toy set includes elephant, giraffe, monkey, panda, bee and lion. The little and sensitive fingers of your baby can effortlessly hold these toys and take with him wherever he wants. 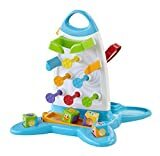 Your baby may be feeling bored or lonely when you are in the kitchen and his old toys no more excite him. The cool and colorful turtle with wheels can be his new best friend. The back of the turtle can be turned and different numbers and shapes will appear. The pull-along feature of the toy can be a great treat to your growing baby. Fisher Price is a well-known brand in the baby toy and accessory industry. The modern babies’ seek multifaceted and innovative toys and the brand well understands the fact. The above toys play a vital role in building a baby’s imagination and learning skills. 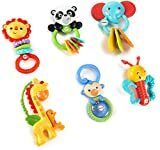 When you bring these wonderful safe non-toxic toys to your baby’s playing regime, you are not wasting your baby’s time.